Vassa (Thai พรรษา, pansa or phansaa), also called Rains Retreat, is the traditional retreat during the rainy season lasting for three lunar months from July to October. During this time Buddhist monks remain in a single place, generally in their temples. 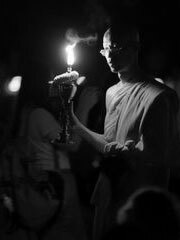 In some monasteries, monks dedicate the Vassa to intensive meditation practice. During Vassa, many Buddhist lay people reinvigorate their spritual training and adopt more ascetic practices, such as giving up meat, alcohol, or smoking (Vassa is sometimes known as «Buddhist Lent»). And in countries such as Thailand, the laity will often take monastic vows for the Vassa period and then return to lay life. Commonly, the number of years a monk has spent in monastic life is expressed by counting up the number of Vassas he has observed. The retreat has largely been given up by Mahayana Buddhists. The origins of the vassa tradition are ascribed to early Buddhist times. Gautama Buddha ordered his disciples to observe a pre-existing practice whereby holy men avoided travelling for a three month period during the rainy season, in order to avoid damaging crops. The period begins on the first day of the waning moon in the eighth lunar month; the preceding day is Asalha Puja. The focus of celebration by the laity is the first day of vassa, Wan Kao Pansa, during which worshippers donate candles and other necessities to temples, a ceremony which has reached its most extravagant form in the Ubon Ratchathani Candle Festival.